We have some of our fabulous floral designs and centerpieces online at www.judysflorist.com and we can help you with any of those. We are known though for our custom design. You call us, tell us what “you” need and we take care of the rest. 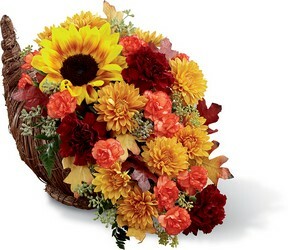 Things to consider for your custom Thanksgiving flowers; are they for your table? If they are, consider the height for beauty but also for conversation across the table. What size of table and the shape of the table will also be important. We can design your table piece right down to the inch in height, length and width with round or oval designs. Next, consider your colors. Table cloths, napkins or linens and we can design to match or contrast with your decor’. If your request for Thanksgiving Flowers Oregon are for more of a gift, you can also choose from many beautiful fall vase or basket designs. Often times people are looking more specifically for serving table designs that are more upright than spacious and low. We can help with theses needs too. As always we have some ideas on our website but are also pleased to help with any custom floral designs you request. The theme of your blog is totally fresh, I am sure that the interested parties that come across your blogs will love your content and advice.